A yoga block is an understated addition to your home fitness equipment. 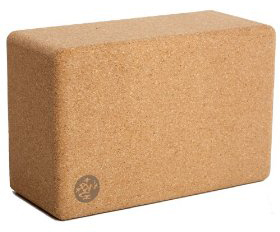 When looking for yoga supplies, we recommend a cork yoga block over a foam block. You can easily find cheap yoga blocks at major discount stores near you, but we recommend you pay a couple of dollars more for a study one. Blocks help support and align the body correctly. They help with more than just yoga poses during your home workout. Yoga blocks are very beneficial to seniors just starting a stretching program, people with low flexibility, and even women in the mid to late stages of pregnancy. Many people use the blocks to sit on when performing easy twists during core warm-ups and well as when beginning their pose routine. This is when a cork block is invaluable. It helps align the spine and supports the sacrum as it elevates the pelvis. We recommend the Manduka Cork Block. * They should measure 9"x 4"x 6"
* Sturdy and easy to grip. * Nice texture. Soft feel. * Optional: No HUGE distracting logo or manufacturer's text. Blocks are a great addition to your home fitness equipment because they help beginners with postures which might have been impossible without them, yet they help advanced students with gaining balance, strength, and optimal alignment. A foam block may be a few dollars cheaper, but we like the naturalness and feel of cork blocks.